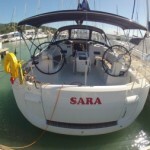 $4,000 per week Off Season: 10th July - 5th November. 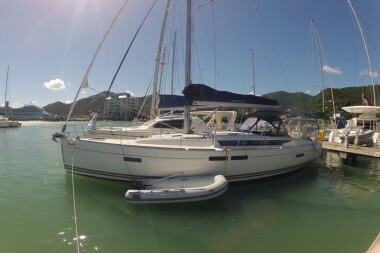 $4,600 per week Low Season: 1st May - 9th July and 6th Nov - 15th Dec.
$5,100 per week Mid Season: 2nd Jan - 31st Jan and 1st April - 30th April. 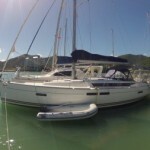 $6,000 per week High Season: 16th Dec - 1st Jan and 1st Feb - 31st March. 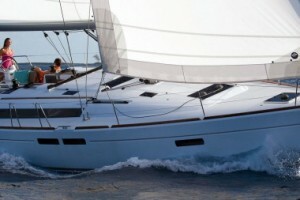 The newest addition to the Sun Odyssey line, the Sun Odyssey 469, benefits from the latest innovations and inherits the finest traits of this iconic line. 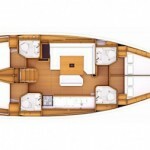 From the design cabinet of Philippe Briand, clean lines and an elongated hard chine hull with moderate freeboard give the Sun Odyssey 469 extraordinary aesthetic value and performance. 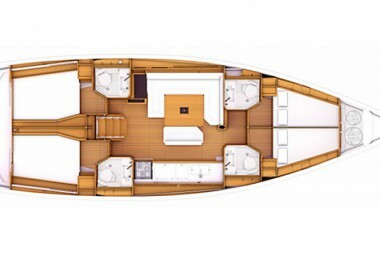 The Sun Odyssey is user-friendly with an efficient deck layout and interior space equal to that of a 50 ft. yacht. 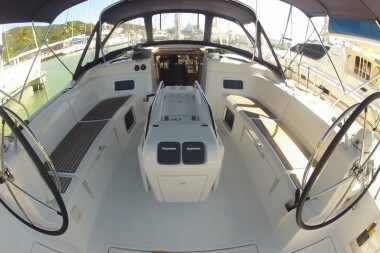 The cockpit is equipped with twin helm stations. 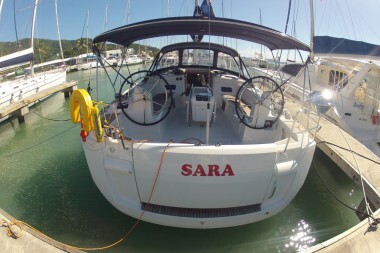 The winches, positioned in front of the helm, enable the helmsman to control the main & genoa sheets – great for sailing short-handed. 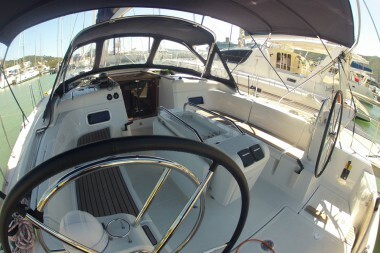 Auto-pilot, GPS/chart plotter and wind instrument are within easy reach and you will appreciate the bow thruster when maneuvering in a marina or in close quarters. 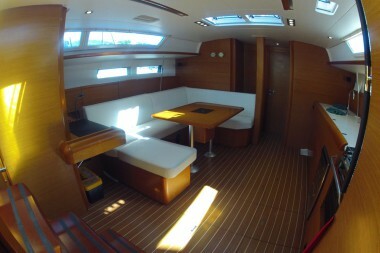 The cockpit is wide with a large central table and comfortable seating. 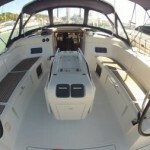 The large aft fold down swim platform, with telescopic ladder, provides easy access to both dinghy and sea. 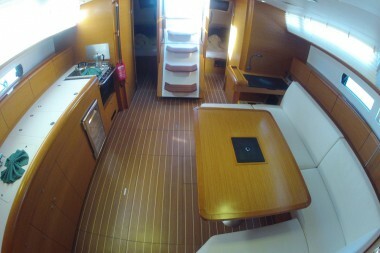 The deck is wide with all tracks and hardware located on the coachroof. 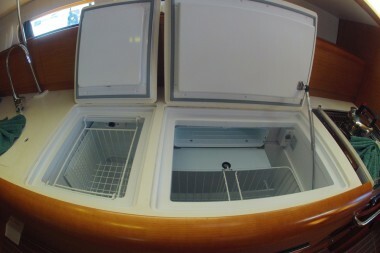 The user-friendly companionway steps are at a 45 degree angle with plenty of hand holds. 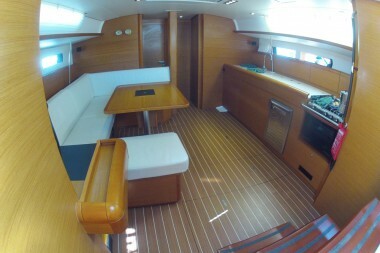 The interior is finished in warm Alpi teak with modern European styling. 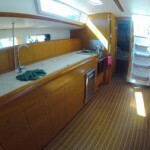 Long coachroof windows plus lots of opening ports and hatches, bathe the interior in natural light. 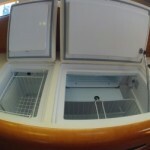 The galley is located on the starboard side with refrigerator, stove, oven, double stainless steel sinks and ample drawers & lockers. 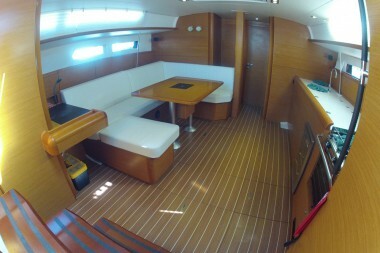 The saloon has a U-shaped seating area to port with a view of the sea through the ports. 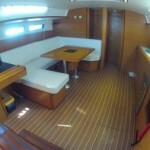 Additional seating is on the settee with storage compartment under. 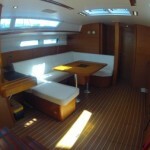 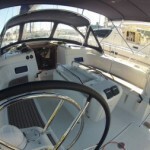 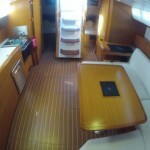 The chart table with a leatherette worktop is to port aft of the saloon. 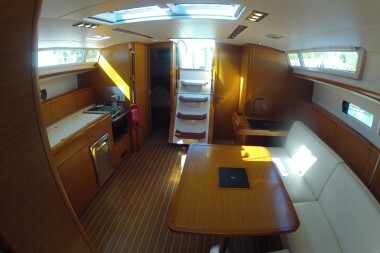 Each of the four cabins has a double berth, hanging locker, LED overhead lighting & reading light. 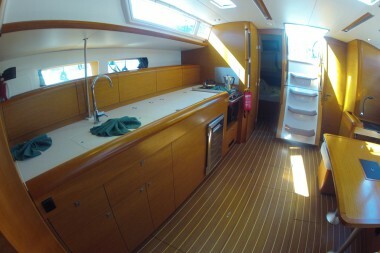 The ensuite heads have a modern countertop with molded sink, storage cabinet, toilet and shower. 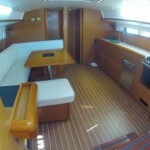 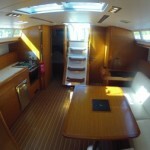 The saloon table converts to provide two additional berths, if needed.